Oreos are one of my total guilty pleasures. A good movie, a big blanket, a sleeve of Oreos and a glass of cold milk is a perfect night to me. 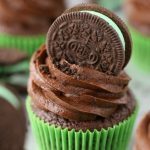 These Mint Oreo Cupcakes are delicious! 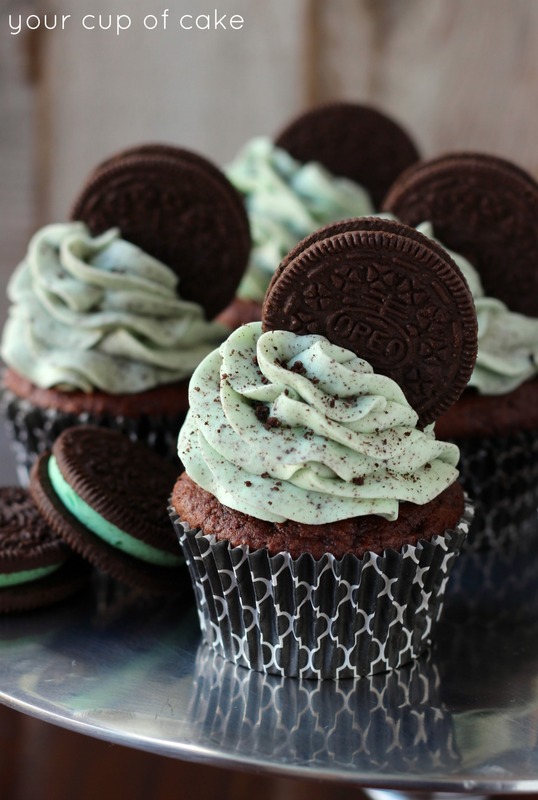 Chocolate cake with a hidden Oreo baked into the bottom, fluffy-minty-cream cheesy-Oreo-frosting and an Oreo on top! Hopefully this post get’s emailed out… crossing my fingers! My parents feel old because they can remember when going to the movies cost less than 2 bucks. I feel old because I remember a time when Oreos only came in one flavor. *NOTE: You can crush your Oreos whole with the filling in a food processor or take out the filling and crush just the chocolate cookies in a plastic bag with a rolling pin. If I do it the second way, I like to put the crushed cookies through ha sifter and only use what falls through. I only use the small pieces because I don't want to clog my piping tip. 2. 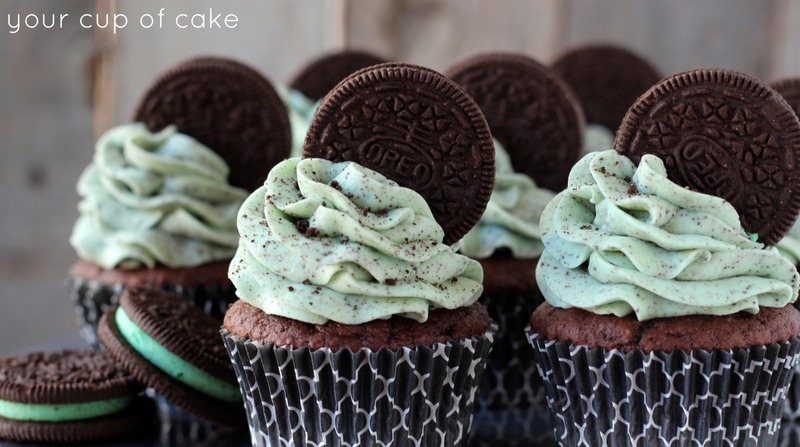 Place an oreo on the bottom of each cupcake liner. (You can twist the oreos and remove one of the chocolate "cookies" if you want. Just place the Oreo cream side up in the pans. You can use the Oreo cookie you removed for either decoration at the end or to crush and make your frosting! 3. Sift cake mix into a small bowl and set aside. 4. In a large bowl, combine eggs, oil, buttermilk, sour cream and vanilla extract until smooth. 5. Stir in cake mix. 6. Fill cupcake liners 3/4 full and bake for 15-20 minute or until an inserted knife comes out clean. Make sure to not bake your cupcakes on the bottom rack or else it might burn the Oreos on the bottom. If you're afraid of burning them, you can always chop up the Oreos and fold them into the batter instead of leaving them whole on the bottom on the liners. 8. 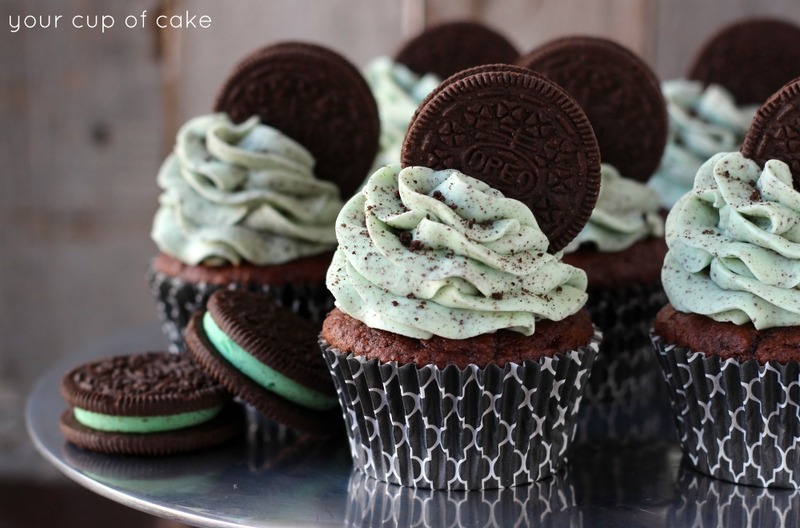 Mint Oreo Frosting: Beat butter and cream cheese for 2 minutes. Add peppermint extract, milk and slowly add in powdered sugar until you reach your desired consistency. Add green dye one drop at a time until you like the color. 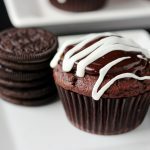 Stir in your crushed Oreos, but don't over mix or else it will start to turn the frosting grey. 9. 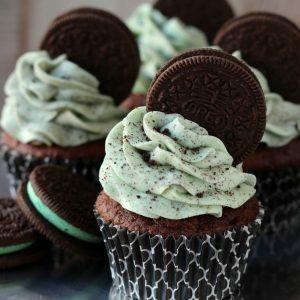 Pipe onto cooled cupcakes and top with extra Mint Oreos for decoration! 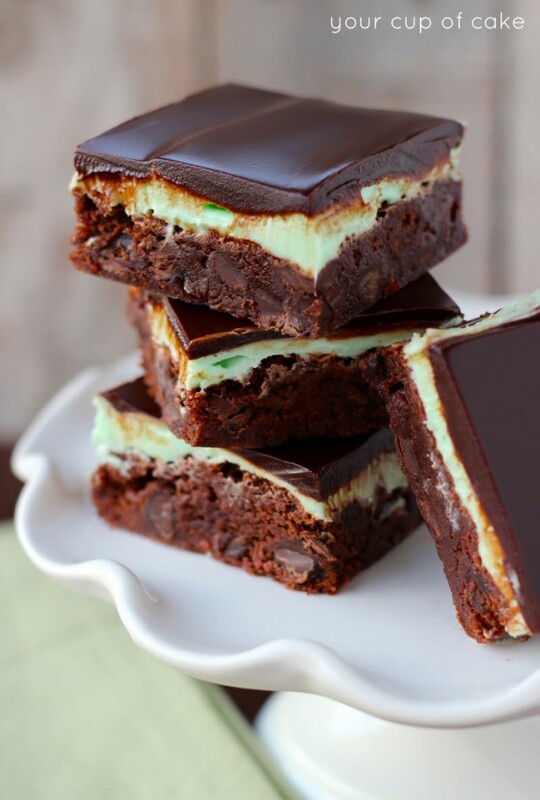 PS: did you see my Mint Brownies from last week? These look delicious. I want to make them this week. 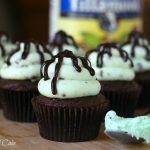 Do you thinnk I could substitute the Oreos with Girl Scout Thin Mints? I’ve just made them and their delicious. But my cream cheese frosting always turns a little too runny. Do you refrigerate it before piping? Ór it might be fall of cream cheese i use (not Philadelphia)? I’ve used generic brand cream cheese, but you have to make sure it’s not low fat or anything like that! Just add more powdered sugar if it’s too runny! Looks yummy! How many cupcakes does this make? 24? Thanks! 20-24 depending on how large you make them! I made these to take to work today, but changed things up a little. I did a “Black and Tan” cupcake with chocolate and yellow cake side by side in the cup. Then used plain buttercream with Andes mint pieces on top. They were a hit!!! I made these cupcakes for work yesterday. The workers said they were “crazy good”. I am diabetic so could not taste them but people had two of them. I then sent a dozen to work with my husband and that plate came home empty also. They looked and smelled amazing. 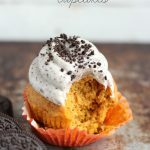 I want to try it with PB oreos and PB icing! Gorgeous! Any chance you’ll share which piping tip number you7 used for this? Thanks! I think this was just a standard Wilton 2D piping tip! My covers are not consistent, what should I do?? I am Brazilian and I love your recipes. Kisses! OMG! THAT LOOKS SO GOOD AND TASTES GOOD! Me and my cousins made it and yumm… Thanks for the recipe, please make more! 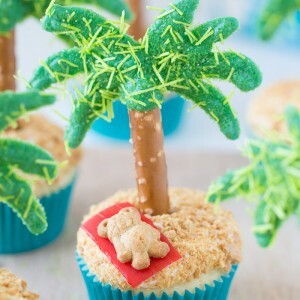 Mmmm, so making this! I was wondering if i could put the oreo in the middle or does it have to be on the bottom? Do these need to be refrigerated over night? 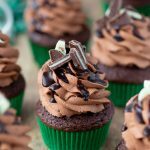 Did you use a closed or open star tip to pipe your frosting? Thanks! 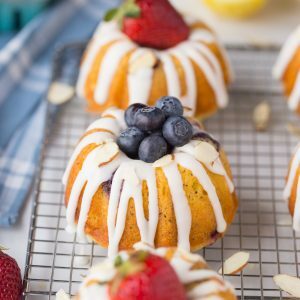 These were absolutely delicious and very easy to make!! Do you by any chance have the nutritional information for this recipe?